Our chestnut walk has to be one of the hidden gems of our walking tours in Italy. The chestnut and wine trail takes you from the Italian Dolomites to the South Tyrol region over 6 nights. This hiking vacation in Italy has been graded level 3 and is on a self-guided basis. South of the Alps and in the shadow of the Dolomites you can hike through some of the prettiest parts of South Tyrol, the main part of the tour is between the cultural capital of Tyrol, Bressanone, and the provincial capital of Bolzano, linking the Southern Tyrolean and Northern Italian cultures. The first part of the walk goes down the Chestnut Path (“Keschtnweg”) before presenting you a vista of the beautiful plateau south of the Dolomites above Bolzano. Vineyards and orchards line the way on the hike through one of the most beautiful areas located in the centre of the South Tyrolean wine region. Lake Kaltern, the most famous lake in South Tyrol, is a further highlight on this route. Castles, palaces and manor houses emboss the landscape of the South Tyrolean Wine Route where numerous wineries avail a tasting of superb wines. The excellent cuisine and the amazing panorama ensure this hike is an unforgettable experience. Join us on the chestnut walk in Italy and be blown away by the beauty of the Italian countryside! Arrive at the hotel in Bressanone. From Bressanone, you hike up to the Pfeffersberg. You pass small hamlets and mountain farms on our way along the plateau. To the south, you have a wonderful view of the Dolomite summits. You reach Velturno and carry on to the Cloister Saben, the Acropolis of South Tyrol, before arriving in the small town of Chiusa. Day 4 Bozen/Bolzano – Kalterer See – Kaltern Dorf/Caldaro paese, approx. 550 m in altitude/approx. 6-7 hours/approx. Day 6 Kalterer See/Dorf – Lana – Meran/Merano, approx. 325 m in altitude/approx. 6-7 hours/approx. After breakfast transfer to Lana. Shortly after Lana the hiking route continues along the famous Marlinger Waals – the longest irrigation ditch in South Tyrol. These irrigation ditches known as Waale were constructed hundred of years ago to supply dry corridors with water. Today these ditches make wonderful paths used for hiking and walking. 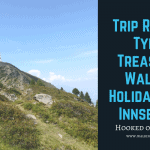 The route continues below Tyrol Castle along the famous, Tappeiner Weg towards Merano. The Empress Sissi knew how to appreciate the mild climate. Inviting centuries old Arbours and superb parks add to the completion of a perfect day. Departure or an extension of the stay can be organised. Well-marked paths are mainly signposted around the meadows and throughout the forests. The Dolomites are always in view and the paths offer no element of danger. You can use public transport on some of the routes to shorten the journey. 3 or 4 star guest houses or hotels. Nearest airports are Innsbruck airport (approx. 83 km), Verona Villafranca airport (approx. 191 km), Treviso airport (approx. 228 km), Venice Marco Polo airport (approx. 313 km). On the Brenner/Brennero motorway (A22) to Brixen/Bressanone or over the Felbertauernstraße to Lienz in Eastern Tyrol (Austria) and then on further through the valley Pustertal/Val Pusteria on the SS49 to Brixen/Bressanone. Take a train from Innsbruck to Brixen/Bressanone. Arriving from the south over Verona and Bozen/Bolzano to Brixen/Bressanone. Arriving from east over Lienz to Brixen/Bressanone.